Soft Pistachio Cranberry Oatmeal Cookies with a hint of cinnamon. 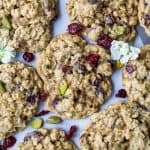 These delicious oatmeal cookies are packed with sweet & salty cranberries and pistachios, guaranteed to be a favorite! In a large bowl, mix oats, flour, baking powder, baking soda, cinnamon, and salt. In a stand mixer, combine butter, vanilla, and brown sugar until creamy. Add in a egg. Mix until combined. Slowly add in the oat flour mixture, mix in stand mixer until just combined. Gently fold in the cranberries and pistachios. Scoop 1 tablespoon of cookie batter on a baking sheet lined with silicone mat or parchment paper placing 2″ apart.